Using sheets of patterned clay, bits of fabric and hardware finds, Dayle Doroshow satisfies her craving for shoes. She hunts for historic patterns or fashionable footwear that appeal to her and then lets her imagination take flight. 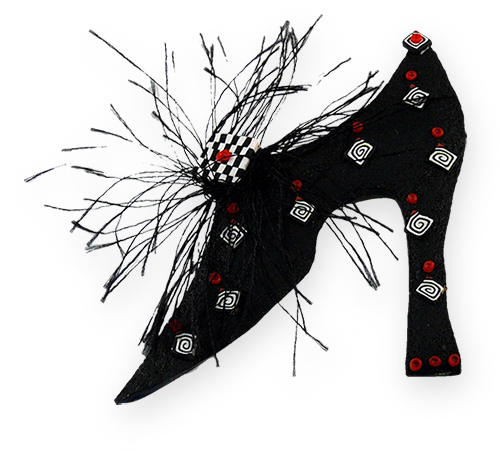 With the addition of a pin back, the shoes become brooches. Dayle shows the basic process on this free video tutorial. See more of Dayle’s enchanting work and find out where she’s teaching on her blog and on Facebook. She’s at Maureen Carlson’s and at the New York guild in May. Be sure to join the online party at Craftcast tonight. It’s the 5th edition of I Love Tools and you’re going to love this one. Thanks Nevenka! Hope you enjoy making your own! These are so much fun and so well made. High fashion meets polymer clay! thanks Alison for your lovely comment. Thanks so much Cynthia- I hope everyone enjoys making lots of shoes! Fantastic shoes. There are amazing. wow these are simply every girls dream. I really love the patterns Dayle has used, they look sensational. Well done Dayle. Thanks so much Debbie, I hope you have fun making your dream shoe collection! These are so cute! Absolutely adorable!! Makes me want to buy new shoes!!! Thanks Barb, Most of us sure don’t need any excuse to buy more shoes- have fun making these! Thank you Wendy adn Kopial- I agree- this is the way to finance a great shoe collection! Oh gosh! Watching the video! I adore her exacto knife. Shoes or exacto knife covers! Where to start for a weekend indulgence!